Set in the video game realm, the fast-paced animated adventure-comedy Wreck-It Ralph has touching emotions that succeed where Toy Story started – entertaining audiences while making them care about inanimate objects as strong characters within engaging environments. John C. Reilly voices the main character Wreck-It Ralph (voiced by John C. Reilly), an original character with echoes of Donkey Kong and Hulk who has become tired of his bad guy role in the classic “Fix-it Felix” arcade game. As the game celebrates their 30th year in existence, Ralph takes life-changing steps that take audiences further into the video game realm where electric outlets and cords provide avenues and ports for characters among other video games. This “Game Central Station” acts as a neutral hub where characters interact. Filmmakers also take advantage of other like making the “surge protector” a law enforcement figure at the station. Cute little dynamo Vanellope von Schweetz, voiced by comedienne Sarah Silverman, Sergeant Calhoun, voiced by Jane Lynch (TV’s Glee) and Fix-it Felix, Jr. (maybe his Dad will be in the likely sequel), voiced by Jack McBrayer (30 Rock) all impress in their considerable roles as Vanellope develops the closest connection to Ralph of the three. Comedians continually stretch the animated entertainment in the supporting acting department with Mindy Kaling (Taffyta Muttonfudge), Ed O’Neill (Mr. Litwak), and Edie McClurg (Mary) without letting their personality overtake their respective characters. Alan Tudyk (I Am Robot) takes the cake…well, maybe the candy as King Candy. Dennis Haysbert has a short, but memorable voice performance as General Hologram. Special video game character appearances include Pac-Man, Frogger, Dig Dug, Q*Bert, Tapper, Paperboy, Bowser, Sonic, Diablo (a.k.a. Satan), and Ken & Ryu from the Street Fighter game. 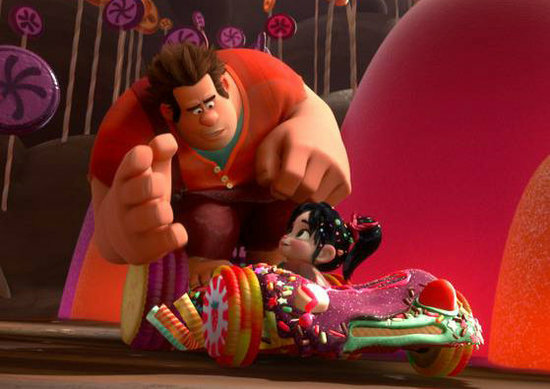 Wreck-It Ralph has clever scenarios, great 3D effects, strong color schemes among three main eras that cover three eras and video game history. Fix-it Felix, Jr. is a classic 8-bit game, set in Niceland, that features Felix, Ralph, and the penthouse window-filling Nicelanders (Mary, Gene, etc.) who react to Ralph’s destructive antics and prompt Felix to make it alright again. Gene is one of Ralph’s biggest detractors while the Nicelanders have great blocky movements that match the functions in the game – simple reactions and linear movements. Sugar Rush represents a Mario Kart-like racing world with candy characters led by King Candy and his two security men…er, donuts voiced by Adam Carolla and Horatio Sanz. Snowanna Rainbeau, Rancis Fluggerbutter, Gloyd Orangeboar, Crumbelina DiCaramello, and Candlehead fill out the confection-themed race roster. Hero’s Duty, a modern, first-person action game, features Sgt. Calhoun and the antagonistic alien Cy-Bugs, which are a deadly threat to the entire arcade. The biggest action sequence gets a roaring, rock music accompaniment to diminish any possible child scares and bolster the amazing action, which leaves audiences wanting even more. Director Rich Moore (TV’s The Simpsons and Futurama) makes an impressive feature-film debut as a director and voice actor with the Zangief and Sour Bill characters. John Lasseter executive produces the film as he has in most of Disney’s animated releases since 2006. A highly recommended film for all ages – boy and girls – and rated PG for some rude humor and mild action/violence. Filmmakers successfully push the film’s appeal well beyond the video game fan realm with clever dialogue, kinetic action, and short, but impactful heartfelt moments. The constant references, visual “Easter eggs”, and gag (e.g., the Wizard of Oz reference is priceless) definitely warrant repeat viewings. This entry was posted in 2010s Film Reviews, Film Reviews and tagged Film, Michael Siebenaler, Mike Siebenaler, Tall Writer, Wreck-It Ralph. Bookmark the permalink.